While working on the best books for boys list I was trying to find some cookbooks that were written with boys in mind. I really enjoy cooking with my son and think cooking is a skill that all boys should learn. I was able to find quite a few. While I was poking around looking for the cookbooks I found a whole lot of fun food cookbooks that I thought they would like as well. These cookbooks focus on fun food and all have boy appeal. There are cookbooks for cute food, scary food, fake/trick food, gross (but delish) food, and even a book on candy construction. These cookbooks will get them into the kitchen and get those boys cooking as well! I am fond of fun food because it is, well, fun! I like to craft and I love tiny details so fun food really fills both of those needs for me. It is sort of like crafting with food. We enjoy making and decorating food. If you think your boy might enjoy it too — give it a try. This is a fun food book that does it up right! Little Monsters Cookbook is amusing, has good recipes and great pictures. For example there is a Spare-Parts Salad: “This tasty salad is great for when you need to use up leftovers . . . leftover monster parts that is! Don’t you just love a plate of nice, juicy eyeballs?” LOL This one may even get your boys to try some new foods. It would be great around Halloween but I think it would really be fun any time of the year as well. Note: I linked to the Kindle version as the paperback version looks different than what I have at home. Mine is spiral bound and only available used. (Almost) Too Cute to Eat is a neat little book that would be great for younger boys. It has really cute, easy to make snacks and treats. FYI it uses a lot of pre-made items and convenience foods but if that is not your thing you can certainly use a cookbook to go homemade and then make these fun food treats with your boy. The Oatmeal Bears (cookies) are super cute as are the Runaway Picnic Ants. This series of cookbooks is interesting and I think younger boys would like them. However, they are pretty pricey for what you get so I suggest trying the library or seeing if you can find them used. I am putting a link here so you can see them. These are the shortest cookbooks I have seen and they only have 7 recipes in each one. The recipes are very simple though and easy to make which makes them nice for beginners. The directions are well done with visuals to help boys along. A Pirate Cookbook is the best one in the bunch followed in order by A Dinosaur Cookbook , An Astronaut Cookbook , A Football Cookbook and A Superhero Cookbook. The superhero one is a disappointment–I wouldn’t even bother with it. A Monster Cookbook is ok but you would do better with the Little Monsters Cookbook above. If your boy is into pirates or dinosaurs be sure to see our list of activities for boys! Ghoulish Goodies (A Frightful Cookbook) is a Halloween Cookbook. It is full of treats. At least 3/4 of the recipes are for cookies, cakes, and candies. The party food, snacks, drinks and meals are in there but sorely lacking. None the less, it is a fun book with some great ideas. The recipes are not short so I would think it would be best for boys who are into cooking or who like to help in the kitchen. Super funny any time, especially for April Fool’s Day, this Fake-Out Food is sure to please. The creations look surprisingly real! Try things like corn dogs made with a brownie center, rolled in peanut butter crust, and topped with yellow and red frosting for condiments, or popcorn that is really a cupcake, a layer cake of meatloaf and mashed potatoes, and Twinkies that sub for sushi. I think boys will get a kick out of making these to fool family and friends. Have Fun! We have looked at Candy Construction a few times and it is pretty neat. My only beef with it (a little food pun there) is that you really need to buy a lot of candy to make the creations. The author has a rule of no eating while building–um, not likely–and just silly. Making the pirate ship and the race cars requires 15 different candies. Yikes! I am including it though because the items they make are really neat and perhaps it will give you some ideas of ways to create your own fun food. It would also likely be a good choice if you want to get rid of a bunch of Halloween or Easter candy by crafting with it. Oh Boy! Roald Dahl’s Revolting Recipes is packed with recipes from Charlie and the Chocolate Factory, James and the Giant Peach and other Dahl books. Would you like to try Stink Bug Eggs, Fresh Mudburgers, or maybe a bit of Lickable Wallpaper?! There are also Even More Revolting Recipes and Completely Revolting Recipes–both available used. What a lot of fun food ideas for boys! I hope you and your boy will try your hand at a few of these. There are a lot of neat cookbooks to choose from and it is a good way to introduce boys to new foods as well as a way to get them trying new techniques. Best Books for Boys: Cookbooks which has some great cookbooks written especially for boys and our big page of fiction and non-fiction books for boys. 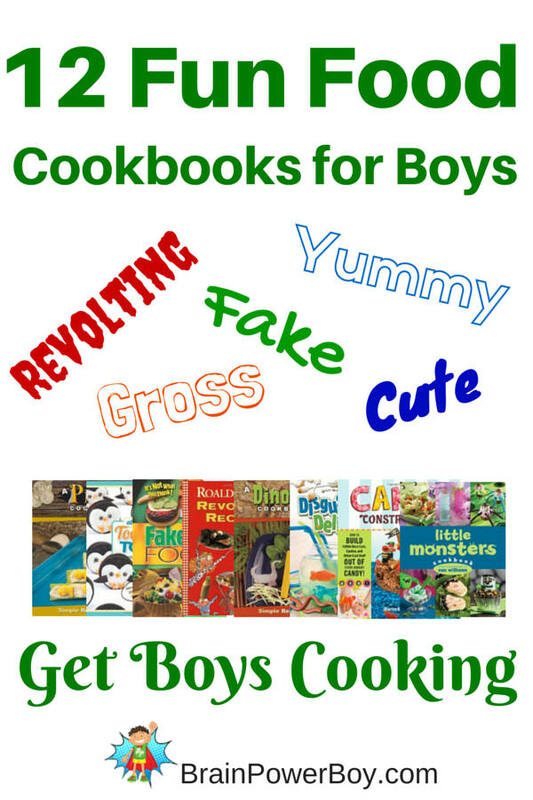 I never knew there were so many cool cookbooks for boys! I think I may have to buy the Disgustingly Delicious one. These do sound like fun – I agree the candy one sounds a bit crazy but I’m adding Fake Out Food to my Wishlist over on Amazon, so when I need a gift for the boys in my life I’ll remember to buy it!